DTX Minnow Sinking 200 - 8"
DTX Minnow 5.5oz. Dives to 40ft. Can be trolled from 4kn-12kn. Full Through wire construction. Features Patented Autotune system. Comes Fitted with 2 x 11/0 Inline Heavy Duty Single Hooks - Please note Colour Swatches are shown without hooks. The ultimate offshore trolling Minnow. Ideal for wahoo, tuna, mahi mahi, kingfish, yellowtail, striped bass, grouper or big salmon. The DTX 200 can be trolled up to 12kn and will reach a depth of 40ft+. It has a great action trolled as slow as 4kn and will reach 40ft even at slow speeds. The DTX Minnow is a revolution in trolling minnows, featuring the Nomad Autotune, Hydrospeed, Diamond Armour and Gorilla Through Wire advanced design technology. 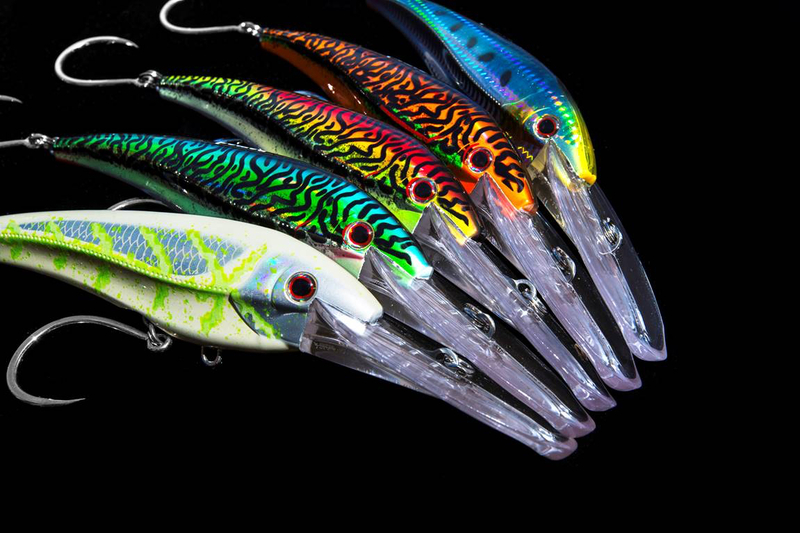 The Autotune design provides for 2 key features– maximum diving depth, and the ability to ensure the lure always swims straight. The DTX minnow with Autotune will always swim straight, first time and every time, no matter how many fish you catch. The other key feature of the Autotune system is the amazing diving depth that can be achieved. The ability of the system to perfectly centre itself every time on the bib means that the towpoint can be designed to be as far back on the bib as possible, effectively just forwards of the point where the lure becomes unstable and won’t swim. However, having the towpoint as close to this “point of not swimming” is what achieves maximum diving depth, but it can only be done with a perfectly centred towpoint using the Autotune system. DTX Minnow Sinking 165 - 6.5"